Aluminum forging furnace, mainly by the furnace, air deflector, circulating fan, heating elements, furnace doors, and electrical control part. The furnace for the furnace door structure (4 or 6 wickets), work can open a wicket, used up after the material off and then open another wicket. 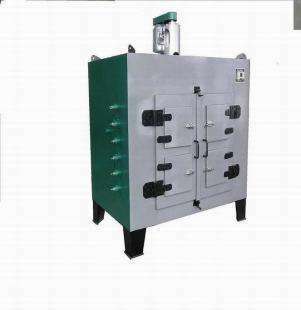 Aluminum forging furnace for the furnace door structure, while feeding the material out of circulation continuous operation, less heat loss and good insulation properties easy to operate. Aluminum alloy forging furnace Uses: This equipment is suitable for aluminum alloy aluminum rod stamping heat treatment.